I love falafel... and I mean love with a capital L-O-V-E because one capital just wouldn't be enough. But spending hours soaking chickpeas, chilling the mixture and then frying them with oil splattering everywhere and making a huge mess in my kitchen? Let's just say my feeling for those parts is pretty much the opposite of love. Luckily, my friends, that just meant I had to come up with a recipe that was way easier and way healthier - and that, my friends is what I want to share with you today! This falafel recipe is super simple. Not only is it way healthier and baked rather than fried, it also doesn't involve any soaking or cooking or chickpeas, absolutely no chill time and it's whipped up in minutes. In fact, the recipe is too good. Why? Because it seems everytime I make a batch, they disappear before my eyes and all of a sudden the container that previously held them is now back in the dishwasher and the SIL family have happy falafel filled stomachs. They're so delicious that even my carnivore husband will happily eat them for dinner and not worry for a second that there wasn't any meat on his plate. That never happens, friends... and they're vegan too! But enough yapping, I'll let the recipe speak for itself! In a food processor, process your onion until chopped. Add in your chickpeas, processing until smooth. Add in the rest of your ingredients, processing until everything is incorporated. Roll your falafel balls (we roll about 2 tbsp mix for one ball) with your hands and place them onto your prepared tray, repeating until all of your mix is used up. 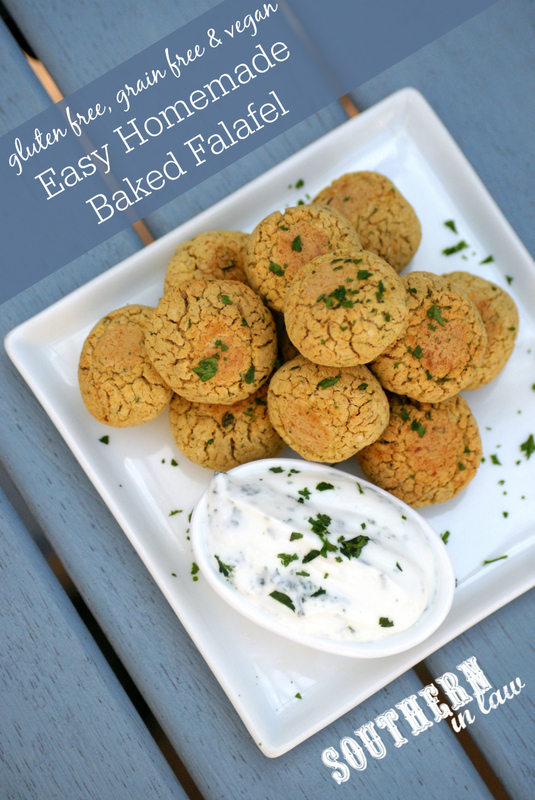 If your falafel mix is too wet, add a little more chickpea flour. 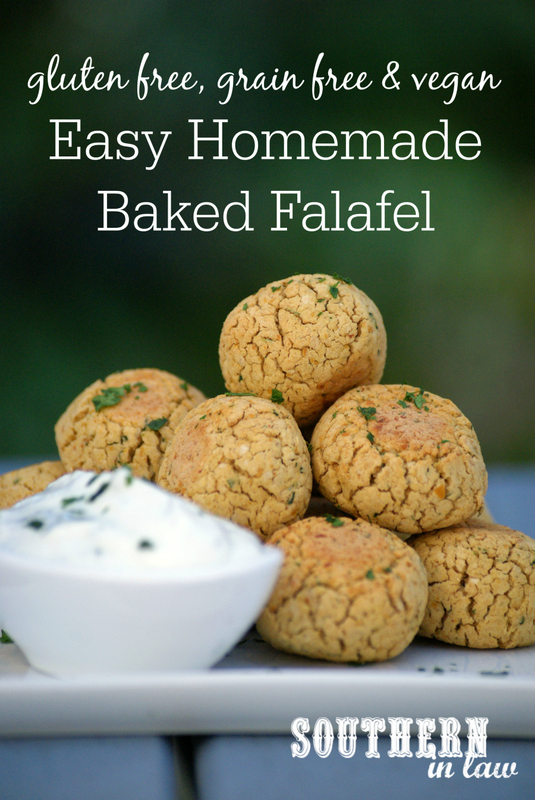 Once all of your falafel are rolled, bake for 30-40 minutes, flipping after they've baked for 20 minutes. 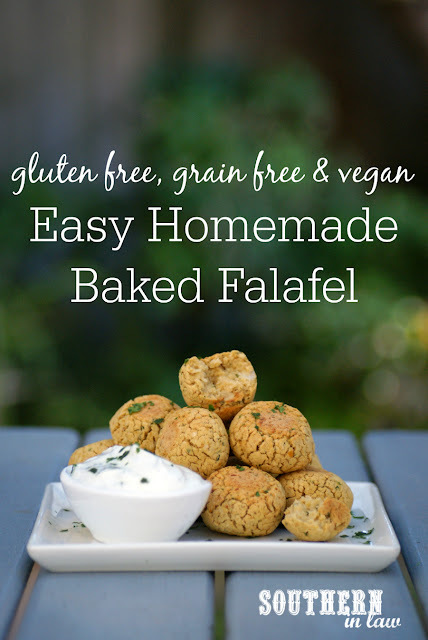 If you like your falafel crunchy, bake them for the full 40 minutes so they're crunchy and golden - if you like them a little softer, take them out after 30 minutes when they're just golden. 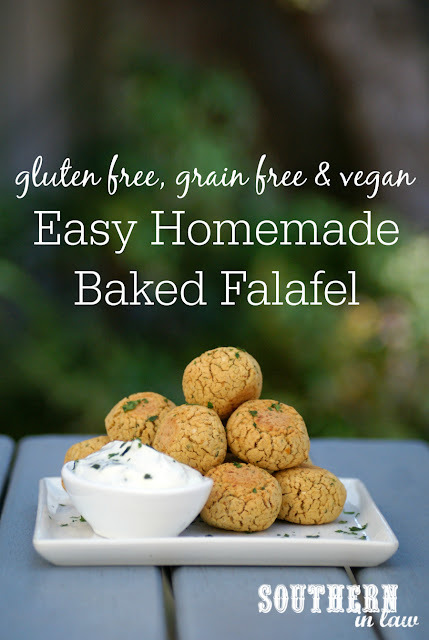 Allow to cool slightly before eating or leave to cool before putting your falafel in a container and keeping them in the fridge until you're ready to eat them! These falafel also freeze really well, just store them in an airtight ziplock bag and defrost and reheat when you want them. *Coriander/cilantro is optional as I've found it's something people either really love or really hate. I'm on the fence but Jesse hates it so we tend to leave it out! The pictured dipping sauce is our Healthy Garlic and Herb Yogurt Dip Recipe. And, are you a coriander/cilantro fan?